Compared to some of my other webcomics cohorts, I definitely fall on the "plan everything obsessively in advance" side of the spectrum. (You can actually hear me yammer on about this on this episode of the Writing Excuses podcast, and hear my friend Jeph talk about working with a more freestyle approach in this one!) But even so, there's still room for charaters to surprise me... particularly minor characters who weren't a major part of the broadest early story planning. I don't actually have a good answer to this question, Maxwell. But I thought I'd post it anyway, because I get asked variations of it quite frequently! I hear from a lot of creators looking for comics collaborators... usually writers looking for artists. Unfortunately, I don't have any great advice about how to do it. I've never worked with an illustrator myself, so I don't know much about the process of finding one. In general, it does seem like there are a lot more writers looking for artists than the reverse. I think it's because the drawing half of the process is a lot more time consuming than the writing -- writers can (and generally do) work on multiple projects, but illustrators can usually only keep up with the workload of one regular comic at a time. But of course, it's not impossible! It's probably just a difficult search. Sorry I can't be more helpful! Good luck finding your future collaborator. I am not sure! I do want to draw a few more, but I'm not sure exactly where it's going to fit into my schedule yet. I might be drawing them spread out, doing individual pieces between other work, which wouldn't work out for a stream. But I'll try to do at least one more stream event before the end of the year! Incidentally, there are now only 9 of the original batch left unsold! You can check 'em all out here. That's a wrap for this week, team. Come back on Monday for more exciting Bonus comics! I have started to write a story, and I have realized that the story is better told in a visual format, than a written one. And I can't draw. This is not a question of desire or skill, but a result of a childhood injury. As a result, I am writing to you, one of the few web artists I know of, if you know any starting artists, who could possibly help. "I have started to write a story, and I have realized that the story is better told in a visual format, than a written one. And I can't draw. This is not a question of desire or skill, but a result of a childhood injury. As a result, I am writing to you, one of the few web artists I know of, if you know any starting artists, who could possibly help." Monday's strip marked the end of Sin's Gambit, and with it, Sam and Fuzzy Missing Inaction! Now that Volume 5 is complete, I'm going to take a brief break and share some goofy stand-alone strips before delving headlong into Volume 6. Come back on Friday for the next one... a special Halloween treat! Speaking of Halloween, thanks for all your great suggestions for the Halloween Sketch-Off! 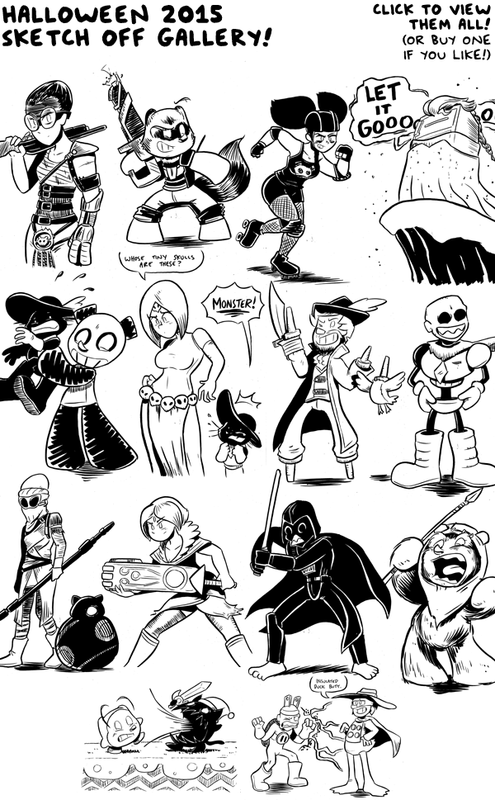 I drew 25 pieces in total, all of which you can view in the Sketch-Off gallery. You can also buy the originals of any of the ones that are currently sold, at $25 for black and white or $50 for marker-colours! At the moment, a little under half of them have already been scooped up. I'm going to try to draw a few more pieces later this week, so if you had an idea that you really wanted to buy, but that I didn't wind up drawing the first time around, tweet or email me and let me know, and I'll include it in the second batch! Friends! Starting at noon Pacific time today, I will be spending my day live-drawing Sam and Fuzzy characters in different Halloween costumes, based on your suggestions! Fuzzy in a Batman costume? Dev in a Fuzzy costume? Mr. Sin in a 17th century chemist Robert Boyle costume? You decide! Just tweet (or email, if you don't twitter) me your idea, and I will try to draw as many of my favs as I can! You can watch me drawn 'em live on Twitch, (Sorry, livestream stopped working) or just see photos of the individual pieces as they are finished on my twitter page. As is tradition, I'll be selling the originals for the special event prices o' $25 for black-and-white or $50 for a marker-coloured version. As is also tradition, it'll be first come first serve, so if you see a drawing you like, tweet or email me to let me know, and I'll get back in touch with you when the event is over!